It’s because We Buy Records is different, he says. Since then, Andy Noble and friends have been pushing that agenda in various ways. Beyond the initial Lotus Land Records shop, they started The Get Down DJ nights in the fall of 2003 in Riverwest. The initial DJs—brothers Tom and Andy Noble, Brent Goodsell and Elliot Oliver—spun rare, small-label funk 45s as a weekly event. The rough self-production and cracks and pops of vinyl added a warmth to the Milwaukee music scene. These days, you might know The Get Down crew more for their New Years Eve blow-out dance parties or second Saturdays at Mad Planet. While you still hear rare funk, the sound has expanded into soul, disco and even some Latin and African jams, while always staying true to music with the independent attitude of its earliest years. Now The Get Down is celebrating its 15th anniversary, Noble’s restaurant Strange Town is celebrating its first full year and his newest record store is celebrating its grand opening. In the interview below, he told us about We Buy Records and how his relationship to vinyl led to it all. There’s a new record shop in Riverwest. 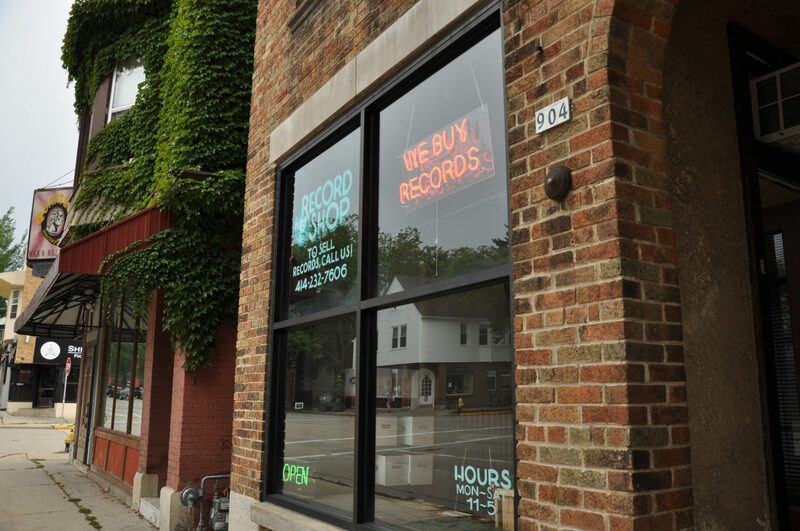 With a red neon sign in the window announcing the store’s name—simply “We Buy Records”—owner Andy Noble opened its doors to Milwaukee in August as a continuation of years of vinyl-related business endeavors. He is the longtime traveling record collector/trader behind the vinyl-spinning vegan restaurant Strange Town and the all-vinyl DJ event The Get Down, which is celebrating its 15th year in 2018. 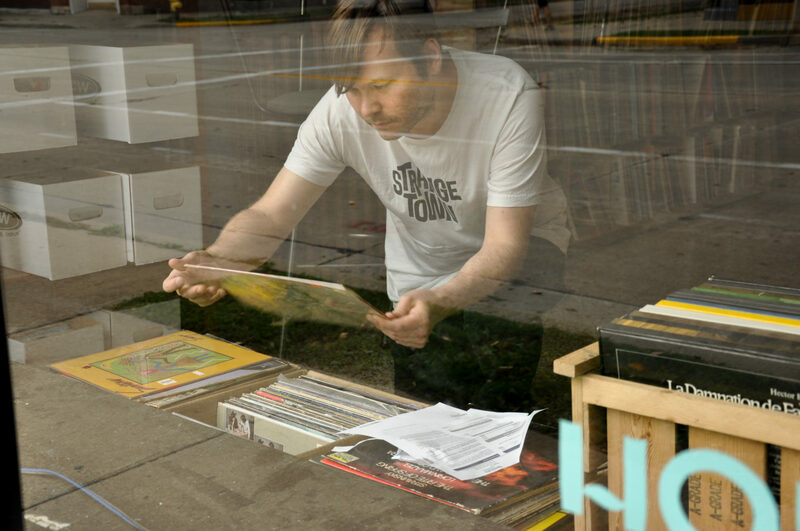 We had a chat with Noble on opening a brick and mortar record shop for the second time and about his adventures in record buying road trips that took him into stranger’s homes around the country. How did your record collecting change after Lotus Land closed? I started to become a really serious collector of local stuff and underground funk and soul records. We started leaving the city for records in a very serious way around mid-late 2000’s. Once we started to dabble in online sales, we started to make friends in the record world outside of the city and our own personal tastes were influenced by these other DJs and collectors from around the world. It started crystallizing what the actual hunt was about. 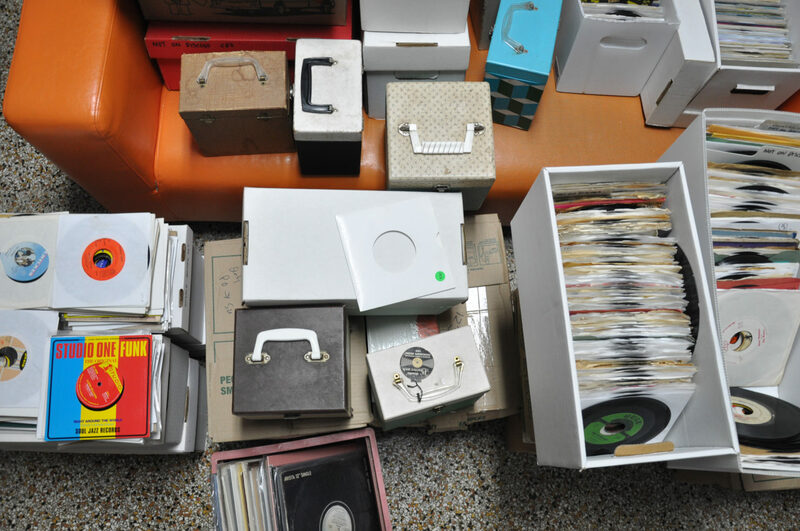 It wasn’t about finding a decent copy of a rare record or something like that, it became very clear the actual hunt was about independently produced, self-financed underground records. What was the record buying lifestyle like? I was sending direct mail in a city a month in advance, then I’d drive in there one day and put up a bunch of signs in the neighborhoods I was interested in buying records from, crash in a motel and stay there for two weeks, three weeks, a month. Sometimes I would do something I called my “rubber band” technique. I would stay in one city and then keep going. Once I got to the last city, I’d stay there as long as I could, then come back to the earlier cities. I would get calls from all the cities while I was in the trip. So by the time I came back to Milwaukee, I would have hit Louisville, Little Rock, Omaha, Tulsa, Oklahoma City, etc. I love mid-sizers. I would get to explore those towns on my own at night. Those were good chops to have. Alone, you get to know the cities really well. A weird side effect of that was getting really into parks. I needed public space in between appointments. Some days you would have really awkward timings for appointments far from where you’re staying, so you have to kill time a lot. So I got really into researching park histories and who designed them. Parks are amazing. What kind of music is We Buy Records about? This shop, as opposed to Lotus Land, is really practical. You go in and there’s Led Zeppelin records, there’s a huge Stevie Nicks section. I hope I’m not being too patronizing. 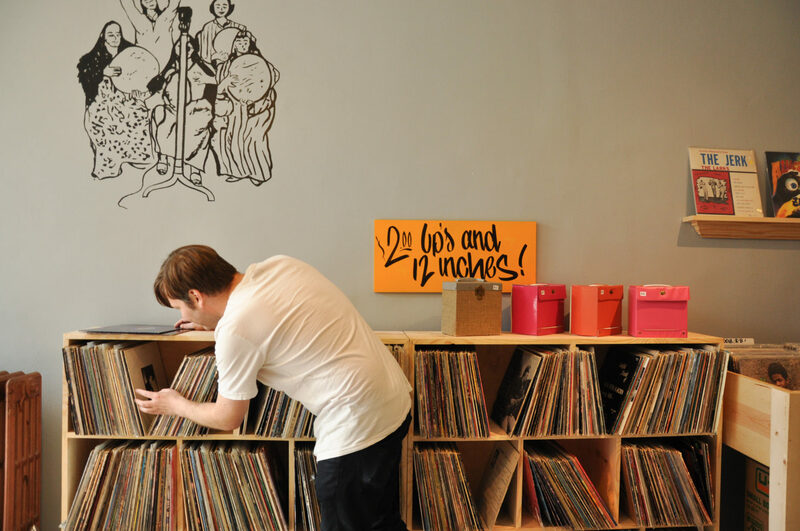 The vinyl buying market is all this or all that. They either only want super rare hundred dollar records or they only want like Stevie Nicks records for two bucks. I have a handful of middle ground people, but that’s the rarest animal, and I want to cultivate more of those customers. The game is still about buying. We opened August 3, during Center Street Days. There were lines of people trying to sell us things before we even opened, so selling has been good. Buying has been okay—not fantastic, but not horrible. We still have online sales and we’ll stay afloat regardless. Buying has been awesome, though. Riverwest is one of three really culturally diverse neighborhoods, so what walks in off the street is inherently very diverse, which is fun. We’ll get punk and indie, right after that, soul and jazz. The store isn’t called “We Sell Records,” it’s called We Buy Records. No. In fact, I have to push it in the ads now, “you know we also sell these f*ckers.” But the game is still about buying. This is the idea: we have a very modern, lovely business run out of a gorgeous back cottage in Riverwest, just beautiful. Because Ryan [King] just got this dream job and we’re just having a mellow, fun time. Then, because the restaurant opened up, I had a baby and basically my serious record buying adventures—me driving around the country buying, not selling—that kind of got curbed. Yeah, I’m a marketing genius [laughs]. I already owned a neon sign that said, “We Buy Records.” Plus, the store is like a record trap, which is what I’m trying to create. If you want to get artistic, you could say it’s the royal “we” – me, the customers, all of us. We hang out, we buy records. There’s that aspect, too. We Buy Records is located at 904 E Center Street.